The tech sector is infamously male-dominated. In the United States, women comprise less than 30% of the tech industry. On the opposite side of the globe, the Middle East is celebrating more women in tech per capita. In the Middle East and North Africa (MENA), 35% of tech entrepreneurs are women.The Middle East’s culture of efficient business and the Internet’s capability to be accessed remotely has established the ideal conditions for women in the Middle East to pursue a career within the field of tech. Arab women in technology exemplify desired global diversity trends. In this blog post, we explore the culture, dynamics, and innovation that are polarizing the dominance of women in the Middle Eastern tech industry. One-dimensional stereotypes and poor depiction in mainstream western culture constrict the understanding of increased development across the region. 35% of online Middle Eastern entrepreneurs and 34–57% of STEM grads in Arab countries are women. The increased percentage of women in tech is a direct result of an increase in educational opportunities for Arab women. In the Middle East, there are underlying cultural incentives influencing their academic prowess. Arab men have a comparative advantage to gain employment. A man is not required to study extensively to earn a decent job, whereas women are required to. Women study harder to earn high marks on end-of-school exams to increase their chances of university and future career options. Men may work in whatever industry they choose as long as they are able to provide means to support a wife and family. Marriage within the cultural context of Arab culture is of high status. This is not extended to women as there are industries that are closed off to women. This requires women to pursue fields that require greater training and knowledge, of which supports the data proving women consistently outperform their male peers in school. Education becomes the means of which to avoid confinement. As the tech industry continues to boom in the Middle East, it has enabled an equal industry that proves to influence the climate of various professional industries within the region. 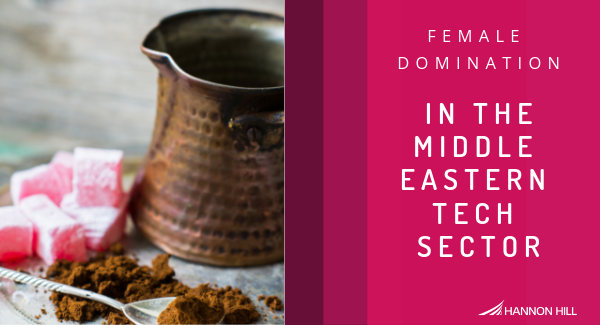 The culture dynamics of the Middle East are majority traditional which sees women fulfilling roles within the scope of the home and family. The flexible nature of tech allows Arab women the opportunity to pursue professional pursuits from the comfort of their home. The traditional values are preserved with a blend of contemporary thought and innovation. The lack of interference between career opportunities and family-oriented values are major bonuses to a region where women are balance their professional pursuits with the role of caregiver. Women are a force to be reckoned with in the arena of tech in the Middle East. Although their tech industry is male-dominated, it is a recent industry and does not carry the stigma of being a male-dominated field as it does in the west. Digital platforms allocate women to be unrestricted from cultural constraints, secure their safety, and avoid the unequivocal cost of transportation and childcare. The traditional values that encourage a strong family unit are preserved and given greater prosperity. A crucial component for the success of Arab women in tech is their ability to engage with the internet and access resources from within their region. There are various resources made available to women in the Middle East beyond the scope of the family compound. Lebanon’s SE Factory is a thorough coding bootcamp offered to young adults in the Middle East. The bootcamp was developed to increase employment in both the Lebanese digital sector and MENA region. The bootcamp is offered to both young men and women to tackle the previous challenge of trained IT professionals leaving the region for employment in an act of diaspora. Smart Dubai is an initiative developed in the United Arab Emirates (UAE) to develop the entire Emirate of Dubai as smart. This involves increased digital development and usage of AI technology. The initiatives employed are determined to lead a paperless society by 2021. These ambitions require a generation of tech-savvy individuals regardless of gender. To fulfill these goals, the government has employed a gender-equal workforce. Notably, their Director General is a female. AlMakinah is an ambitious program developed by two Egyptian women in their twenties. The program offers training on web development and programming. As resources such as these become more dominant and accessible across the entire MENA region, the greater the opportunity for women to diversify and lead the tech industry. Dubai and Lebanon boast their own version of Silicon Valley in which tech-savvy entrepreneurs are encouraged to expand their digital presence. The Beirut Digital District (BDD) was developed to foster a generation of tech-inclined Lebanese young adults. The BDD provides space and a community for tech startups. BDD employs over 1,300 employees, with the gender ratio being 55 percent women to 45 percent men. There is no tech industry in th western world that can rival that level of female dominance. Dubai’s Internet City, settled directly beside Dubai Media City, is a technology park designed to serve as locations for major regional and international technology companies. Facebook, Google, Samsung, and IBM are merely of the tip of industries nestled in Dubai Internet City. The “city” serves as employment opportunities for both men and women within the region with the applied technical capabilities. In Jordan, iPark serves as a technology incubator and source of ICT training within the country. iPark boasts several locations around the country and is accessible for tech startups to begin their business practices. As resources such as these grow in size and demand a greater number of employees, there is greater employment opportunities for both women and men in the field of technology. Women in tech are absolutely crushing it in the Middle East. Sara Al Miri of the UAE is the Deputy Project Manager for the Emirates Mars Mission and sits as Minister of State for Advanced Sciences for the Emirati government. Lebanese doctor Nadine Hachach-Haram and Talia Ali Ahmad developed an award-winning AR platform titled Proximie that allows for virtual surgical learning. Proximie has been utilized by surgeons in conflict zones such as the Gaza Strip. Yale University has joined Proximie as a partner. Mechanical engineer Ghada Eltanawy launched the e-commerce platform La Reina for Egyptian women seeking to rent wedding gowns and formal dresses. Research has proven that the role model effect is accurate and effective in inspiring young women. As these women, and hundreds more alongside them, continue to dominate and innovate the tech industry. And they hope to inspire more women to join them amongst the ranks technology. As the role model effect nurtures professional interpersonal growth, it is vital for tech companies to foster environments that promote women to grow and inspire to increase the attractiveness of the industry to influential young women. Tech companies facilitate transactions where gender is irrelevant. With more time and continued development, tech companies will be able to garner copious amounts of undervalued female labor. Technology has much to offer women and in response, women has much to offer technology. As the culture and resources continue to develop and notable female innovators strive to exemplify, a woman’s place in tech within the Middle East will be that of dominance and success.